Creative Planning has advisors in most states and clients in all 50 states. Our fierce commitment to independence means you get unbiased advice, not sales. No hidden fees, commissions and none of our own mutual funds or hedge funds to cloud our vision or create conflicts of interest. We are singularly focused on providing advice and solutions that champion your best interests. After interviewing fifty of the world’s greatest financial minds and penning the #1 New York Times bestseller Money: Master the Game, Tony Robbins returns with Unshakeable. This step-by-step playbook takes you on a journey to transform your financial life and accelerate your path to financial freedom. In this book, he teams up with Peter Mallouk, the only man in history to be ranked the #1 financial advisor in the US for three consecutive years by Barron’s. Together they reveal how to become unshakeable—someone who can not only maintain true peace of mind in a world of immense uncertainty, economic volatility, and unprecedented change, but who can profit from the fear that immobilizes so many. "Creative Planning, is at the vanguard of a profound shift in finance: the move away from brokers and mutual fund companies peddling products for a fee, and toward firms offering truly independent, low-cost investment advice." Providing financial peace of mind in all 50 states! Regardless of what the TV commercials insinuate, the vast majority of name brand firms are technically “brokers.” This means they get paid for putting your money in products or funds that benefit the house. We offer a refreshingly unbiased approach where we resolutely support your financial health, steer progress, and act as your legal fiduciary by upholding your interests above our own. Established in 1983, we demonstrate our devotion to taking excellent financial care of our clients by surrounding them with a team of credentialed experts. Our team includes CERTIFIED FINANCIAL PLANNER™ professionals (CFP®), Certified Public Accountants (CPA), Estate Planning Attorneys (JD), Risk Management Specialists and Retirement Planning experts. Everyone Deserves the Ultra Wealthy Treatment. Our holistic family office approach offers a full range of experts from every relevant field. 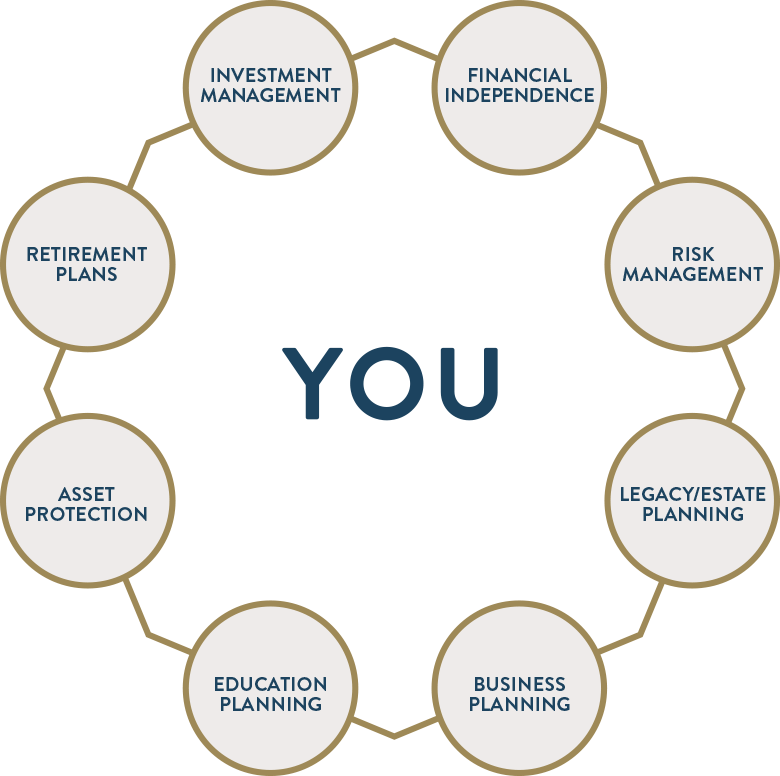 This sets us apart from other independent financial advisors that typically only offer investment advice. Creative Planning gives you multidimensional advice – true comprehensive wealth management that is normally reserved for only the ultra-wealthy. Depending on the size of your portfolio and the complexity of your financial situation, Creative Planning offers a dedicated team approach that is appropriate for you. $50,000 to $400,000 – Your wealth manager will work with you over the phone (or via Web Based Meeting). $400,000 to $10 Million – You will be connected to a local wealth manager and support team for personalized face-to-face comprehensive planning. $10 Million and up – For clients with a net worth exceeding $10 million, we offer a dedicated Private Client Group which provides a higher level of expertise and knowledge required for clients with more intricate financial needs and larger estates. © Copyright 2019 Creative Planning, Inc. All rights reserved. Important disclosure information. Creative Planning, Inc. (“Company”) is an SEC registered investment adviser located in Leawood, Kansas. Company and its representatives are in compliance with the current filing requirements imposed upon SEC registered investment advisers by those states in which Company maintains clients. Company may only transact business in those states in which it is registered, or qualifies for an exemption or exclusion from registration requirements. Company’s web site is limited to the dissemination of general information pertaining to its advisory services, together with access to additional investment-related information, publications, and links. Accordingly, the publication of Company’s web site on the Internet should not be construed by any consumer and/or prospective client as Company’s solicitation to effect, or attempt to effect transactions in securities, or the rendering of personalized investment advice for compensation, over the Internet. Any subsequent, direct communication by Company with a prospective client shall be conducted by a representative that is either registered or qualifies for an exemption or exclusion from registration in the state where the prospective client resides. For information pertaining to the registration status of Company, please contact the SEC or the state securities regulators for those states in which Company maintains a notice filing. A copy of Company’s current written disclosure statement discussing Company’s business operations, services, and fees is available from Company upon written request. Company does not make any representations or warranties as to the accuracy, timeliness, suitability, completeness, or relevance of any information prepared by any unaffiliated third party, whether linked to Company web site or incorporated herein, and takes no responsibility therefore. All such information is provided solely for convenience purposes only and all users thereof should be guided accordingly.Please remember that different types of investments involve varying degrees of risk, and there can be no assurance that the future performance of any specific investment or investment strategy (including those undertaken or recommended by Company), will be profitable or equal any historical performance level(s).